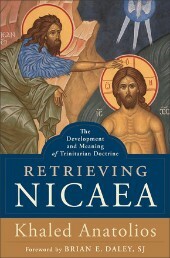 Retrieving Nicaea: The Development and Meaning of Trinitarian Doctrine, Khaled Anatolios, BakerAcademic, 2011. I recall the first time someone told me the story of the events surrounding and during Nicaea. I was enthralled. The story was one marked by a clear dividing line between good and evil as are all of the best stories. There were those who espoused a truly biblical faith, and the pretenders whose "Christian theology" was the result of drinking deeply from pagan philosophy. There was of course, faithful Bishop Alexander and his pupil Athanasius; the seemingly tireless defenders of the deity of the Son of God. In opposition was the insidious Arius and a legion of churchmen whose doctrinal commitments were informed by Satan himself. If you've heard this story, Khaled Anatolios wants you to know that you've bought into a generalized portrait of a complex set of historical circumstances, people, and doctrines. While he does admit that characterizing the councils of "Nicaea and Constantinople as a struggle between 'Arians,' on the one side, and Nicene theology, defended most prominently by Athanasius and the Cappadocians, on the other" "is not entirely lacking in either historical foundation or theological justification," Anatolios wisely incorporates pertinent examinations of the relevant theologians and their respective theologies. The author begins by laying a bit of historical groundwork by providing a retelling of the theological conflicts just previous to Nicaea. Thereafter he provides the reader with a brilliant means so as to differentiate those theologians who were for and against the theology affirmed by the council. This is no easy charge, since there existed a diversity of theologies not just between the two sides, but on each side. Anatolios draws his dividing line between "those theologies that spoke of the unity of the Trinity as a unity of being and those that spoke of a unity of will." This is the best means of differentiation that I have encountered. Take for example the person and theology of Marcellus of Ancyra. While Marcellus affirmed Nicaea and argued fervently against both Arius and Asterius, his theology resembled the form of unitarianism embraced by Oneness Pentecostals (i.e., a form of modalism). Thus, it is not enough to merely draw the line between those who affirmed Nicaea and those who didn't. Rather, Anatolios draws the line directly at the sweet spot, allowing for the actual diversity of theologies. "From this perspective, the inherently systematic character of doctrinal development becomes readily apparent, inasmuch as the process, at its deepest level, entails reconstructing coherence in the face of the threat of incoherence." This means of understanding Trinitarian doctrinal development is decidedly accurate and subsequently helpful. It is true that the various theologies were the result of men grappling with the biblical data within the context of their personal affirmation of Christianity (i.e., the experience). While such a model serves to help the reader understand how these theologies developed, it would seem that Anatolios utilizes the model so as to incorporate a kind of legitimacy of the those theologies that deny the ontological co-equality of the Father and Son. That is, Anatolios identifies those theologians as "Trinitarain Theologians of Unity of Will." Truly though, what kind of Trinitarian theology did Arius affirm? How could a theology that denied the eternal Fatherhood of God ever be given the moniker Trinitarian? If the word Trinity has an actual historic meaning that specifically affirms not only a particular identity of God but also a certain hermeneutic, utilizing the terminology of Father, Son, and Holy Spirit does not a Trinitarian make. Many throughout the history of the church people have misapplied titles to themselves and others, but virtually no one consistently consents to the abuse of terminology therein. Anatolios then provided an outstanding analysis of each of the major theologians involved in the controversy. Arius, Asterius, Eusebius of Casarea, Eunomius, Alexander, Marcellus, and more. I have yet to find such a fine concise treatment of these men and their theologies. That being said, the treatment of Athanasius is absolutely masterful. In fact, it is so good that one would do well to purchase, read, and re-read this work on the basis of his description of Athanasius alone. His treatments of all these men is evenhanded, rigorous, and an outstanding asset to any library. That being said, I can't wait to read the Anatolios' full length volume on Athanasius. 1. Anatolios, Retrieving Nicaea, 28. 6. Truly, this issue is one of secondary importance regarding Anatolios' excellent work. However, in my opinion, such a characterization (i.e., affirming that those who deny the ontological equality of the Father and Son are in any sense Trinitarian) not only confuses the issue, but also empties the term of actual objective meaning.